The antiangiogenesis therapies, including tyrosine kinase inhibitors (TKIs) and mTOR inhibitors, are targeted therapies that are designed to slow the growth of tumors and cancer cells and shrink the size of the tumor.5 A new TKI was recently added to the treatment options of patients with advanced RCC. The FDA-approved expanded indication for lenvatinib, a receptor TKI, in combination with everoli­mus, marks the availability of an important second-line treatment option for patients with advanced RCC. Available as a convenient once-daily capsule, lenvatinib targets VEGF receptors and other pathways implicated in angiogenesis, tumor growth, and cancer progression. Patients who received lenvatinib plus everolimus had a 9.1-month longer PFS compared with everolimus alone. Moreover, the median overall survival was 10.1 months longer with the addition of lenvatinib to everolimus therapy. Copyright © 2017 American Health & Drug Benefits. Used with permission. National Cancer Institute. SEER stat fact sheets: kidney and renal pelvis cancer. http://seer.cancer.gov/statfacts/html/kidrp.html. Accessed September 8, 2016. American Cancer Society. Kidney cancer (adult)—renal cell carcinoma. Revised May 16, 2016. www.cancer.org/acs/groups/cid/documents/webcontent/003107-pdf.pdf. Accessed September 8, 2016. American Society of Clinical Oncology. Kidney cancer—overview. Cancer.Net. www.cancer.net/cancer-types/kidney-cancer/overview. Accessed September 8, 2016. Mayo Clinic staff. Diseases and conditions: kidney cancer: treatments and drugs. February 13, 2015. www.mayoclinic.org/diseases-conditions/kidney-cancer/basics/treatment/con-20024753. Accessed September 8, 2016. American Society of Clinical Oncology. Kidney cancer: treatment options. Cancer.Net. www.cancer.net/cancer-types/kidney-cancer/treatment-options. Accessed September 8, 2016. US Food and Drug Administration. Lenvatinib in combination with everolimus. May 13, 2016. www.fda.gov/Drugs/InformationOnDrugs/ApprovedDrugs/ucm501070.htm. Accessed September 8, 2016. Lenvima (lenvatinib) capsules [prescribing information]. Woodcliff Lake, NJ: Eisai; August 2016. US Food and Drug Administration. FDA approves Lenvima for a type of thyroid cancer. Press release. February 13, 2015. www.fda.gov/NewsEvents/Newsroom/PressAnnouncements/ucm434288.htm. Accessed December 27, 2016. Eisai. Lenvima (lenvatinib) capsules: distribution and financial assistance information. September 2016. www.lenvima.com/pdfs/access-reimbursement-brochure.pdf. Accessed September 8, 2016. Motzer RJ, Hutson TE, Glen H, et al. 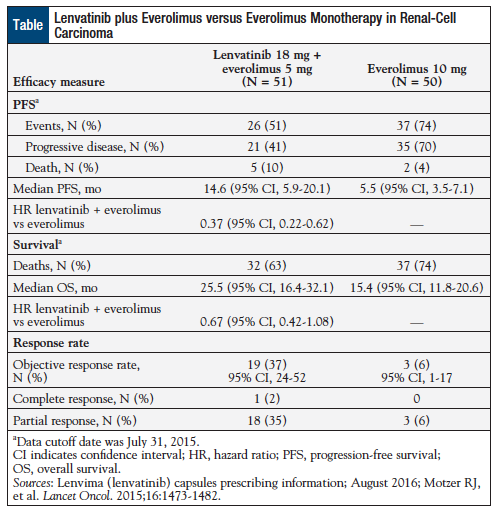 Lenvatinib, everolimus, and the combination in patients with metastatic renal cell carcinoma: a randomised, phase 2, open-label, multicentre trial. Lancet Oncol. 2015;16:1473-1482.